Speaking at the European Payment Summit this year, where he was chairing the panel discussion on Mobile Digital Payments, Michiel Verhaagen (Chief Commercial Officer at AirPlus International) told a story about forgetting his wallet and made the point that he always looks for taxis that accept credit cards and the problems he had trying to find one after arriving in Brussels for the conference. I had exactly the same problem, and I’m steadily becoming more militant about it. When I arrived in Brussels for the event I went to the taxi line at Zaventem and got into the first taxi in line, reassured by the Visa/MC sticker in the window. I loaded my luggage in the back and settled down. 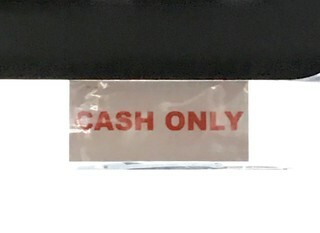 Just as the taxi was about to move off, I saw a sign in the back saying, in several languages, “no cards, cash only”. I told the driver to stop and got out. A woman, next in line, walked toward the taxi and asked, in an American accent, if I didn’t need the taxi. I told I didn’t, because it didn’t take cards. She told me that in that case she did want it either. My heart skipped a beat. I’m a sucker for an American accent and a dislike of cash. A payments soulmate! We walked down the line of taxis together to find one that took cards. When we did, I think it was like the fourth or fifth in line, I naturally opened the door for her and moved on down the line. Fortunately the next taxi took cards as well, so I hopped in and headed to La Hulpe. Unless we vote with our feet, nothing will change. The same is true in London, by the way, where if I get in a cab and it says “cash only”, I get out right away. It’s the only language they understand. The Mayor of London has just said that all London cabs must take cards by October, but there’s about to be some pushback on this. 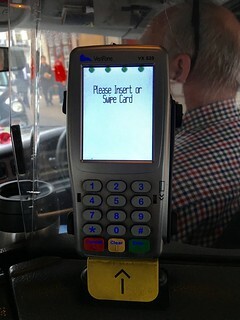 However, the group said it was now planning to use the money it has raised so far, more than £350,000, to prevent TfL’s plans to have a contactless credit card reader installed in every cab, which it said could cost cabbies “tens of millions”. I think I might be able to pour some oil on troubled waters here. The goal is for the average passenger to be able to get in a taxi and get somewhere in London without having to use cash. Another goal is for the average business passenger (eg, me) is to get a receipt that you can use when you submit your expenses at the end of the month. Frankly, an app like Hailo does both of these things and it does them much better than a card does, contactless or otherwise. It’s not about tap and pay, it’s about app and pay. Hence the obvious compromise position. Instead of regulating on the basis of specific technology like contactless, taxis should be regulated on the basis of the desired outcome, which is cashlessness. Why not require taxis to accept contactless payments or any one of a number of acceptable in-app solutions. If the driver refuses to accept any one of the acceptable in-app solutions (e.g., Hailo) then the ride is free. Furthermore, I would make it illegal to surcharge for a debit transaction or an in-app debit or (soon) instant payment transactions. Let them surcharge whatever they like for credit cards, cash, cheques, Bitcoins, cowrie shells or tickets to West End shows. Am I going to our office in Guildford? If so, continue to office in Guildford. I can use my phone to buy lunch, coffee, whatever, so I don’t need my wallet. Am I going into central London? If so, I call South West Trains every name under the sun, because the ticket machines at Woking station don’t take contactless, and return home for wallet. I can pay for the bus to the station with an app, I can pay for parking at the station with an app, I can pay for anything I need in London during the day (coffee, lunch, taxis, buses, tube) with my iPhone, but on South West Trains I am trapped in 2006 time warp. Am I going overseas? If so, I’ve got my travel wallet in my bag and that has my passport, an Amex card, and a Caxton FX card that I can top up from an app, so continue. Am I going somewhere else in the UK? If so… well it depends. If I’m driving somewhere, I can use my phone to buy coffee and lunch, I can use my Shell app to buy petrol. I’ll probably go. I once did drive off without my wallet, in the days before Apple Pay and Shell apps, and I ran out of petrol in Watford. I called the AA, and they told me that they couldn’t bring petrol because it’s against health and safety regulations, so they towed me to a garage. I filled up the car, wandered in to pay and… discovered I’d left my wallet at home. (Not the first time I’ve done this.). Having thought about it, and left the car keys with the clerk at the filling station, I phoned my bank. It turned out that there was a branch a few minutes walk away, so I set off to find it. On the phone, I answered some security questions, and when I got to the branch there was (if memory serves) £30 waiting for me. Hats off to Barclays. We are surely (South West Trains unique role as boat anchor against progress notwithstanding) not that far away from the day that I started dreaming about when I saw my first Nokia phone will contactless payment all those years ago. The day when it finally doesn’t matter if you leave your wallet at home. Or “VC-Day” as I intend to call it (for Victory over Cash Day).